Case Studies in Paleoethnobotany focuses on interpretation in paleoethnobotany. In it the reader is guided through the process of analyzing archaeobotanical data and of using that data to address research questions. Part I introduces archaeobotanical remains and how they are deposited, preserved, sampled, recovered, and analyzed. Five issue-oriented case studies make up Part II and illustrate paleoethnobotanical inference and applications. A recurrent theme is the strength of using multiple lines of evidence to address issues of significance. This book is unique in its explicit focus on interpretation for "consumers" of paleoethnobotanical knowledge. 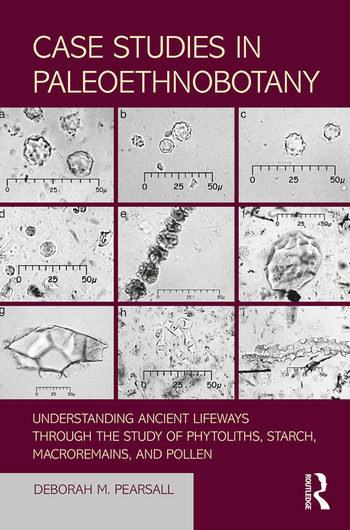 Paleoethnobotanical inference is increasingly sophisticated and contributes to our understanding of the past in ways that may not be apparent outside the field or to all practitioners. The case study format allows in-depth exploration of the process of interpretation in the context of significant issues that will engage readers. No other work introduces paleoethnobotany and illustrates its application in this way. This book will appeal to students interested in ancient plant–people interrelationships, as well as archaeologists, paleoethnobotanists, and paleoecologists. The short methods chapters and topical case studies are ideal for instructors of classes in archaeological methods, environmental archaeology, and ethnobiology. Deborah M. Pearsall is Professor Emeritus at the University of Missouri, having retired in 2013 after 35 years. She holds a BA from the University of Michigan and an MA and PhD from the University of Illinois, all of which are in the subject of Anthropology. Her interests within this discipline center on South American archaeology and paleoethnobotany: the study of plant–people interrelationships through the archaeological record. She has conducted paleoethnobotanical research in numerous locations in the Americas. Her research has two broad themes: the origins and spread of agriculture in the lowland Neotropics, and methods and approaches in paleoethnobotany. She is the author of three books: Paleoethnobotany: A Handbook of Procedures; Plants and People in Ancient Ecuador: The Ethnobotany of the Jama River Valley; and, with D. R. Piperno, The Origins of Agriculture in the Lowland Neotropics. She was also the general editor of Academic Press’s 2008 Encyclopedia of Archaeology and has published in numerous professional journals and edited collections.